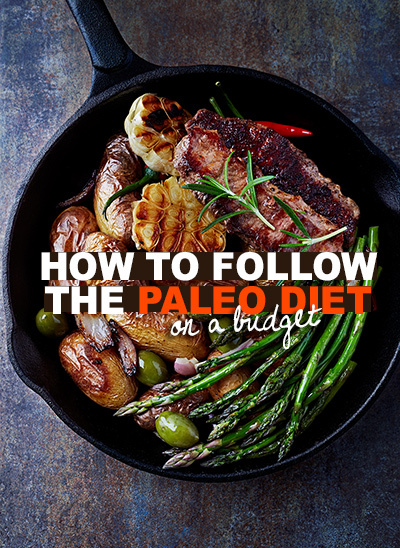 Are you re-thinking your decision to try the Paleo diet because you’re afraid to break the bank? Eating paleo means eating high quality, fresh produce. But that doesn’t mean it has to be expensive. The following money-saving, budget-friendly tips should help your food budget go the extra mile or two. Buying a whole goat or half a cow directly from your local farmer will save you money in the long run. Check out Eat Wild for a comprehensive list of pasture-based farms in various states. Bonus: you’ll also be sure that your meat is local and that the animal has been well treated. Tip! If you can’t get access to grass-fed beef, buy grass-fed lamb or pastured chicken (you’ll look for a recipe later). Or ask for frozen, locally farmed meat or pastured chicken. Save even more money an go for for cheaper cuts of meat, such as brisket and offal, which contain important nutrients that balance out those found in lean meats like steak and chicken breast, and are especially delicious when slow-cooked. If you really can’t fit ‘best choice’ meat in your budget, it’s better to go for conventional meat than cheaper processed meats (or a bagel). However, make sure to trim as much fat (and poultry skin) as you can – the antibiotics and hormones given to ‘farmed’ animals tend to accumulate in the fat. Canned fish such as salmon, sardines, herring and skipjack tuna are way less expensive than fresh wild fish – simply make sure to buy BPA-free certified canned foods (and don’t forget to recycle). Keep in mind that wild fish may be contaminated with mercury: check out this list to find out which fish are considered the least contaminated. Compared to cage-free eggs, pastured, organic eggs are more expensive but they’ll provide you with a protein-dense meal for a fraction of the cost of grass-fed beef. Don’t know where to get extremely fresh, local and organic fruits and veggies at a low cost? Why not join community supported agriculture and invest in crop production at the beginning of the year? This way, you’re (almost) guaranteed to get your basket of fresh goodies as soon as harvest kicks off! Check out Local Harvest for more details. Tip! If your budget is really tight, skip the less nutrient dense veggies such as lettuce or cucumbers and go for the dark green leafy stuffs. And there’s no need to buy everything organic – according to the Environmental Working Group, produce such as cabbage, sweet peas, asparagus, eggplants, cauliflower, sweet potatoes, cantaloupe, avocados, pineapples, mangoes, papayas, kiwi and grapefruit are considered to be the least contaminated by pesticides. You could buy these non-organic. And it’s okay to buy frozen veggies. True, you may not get that ‘I’m one with the land‘ kind of feeling, but frozen veggies and fruits often contain more vitamins and nutrients than fresh ones – produce that is to be frozen is usually harvested with great care and rapidly preserved in cold environments to retain quality (and nutrients). When it comes to foodstuff you can freeze or shelf-stable staples like cold-pressed virgin olive oil, virgin coconut oil or almond butter, buying in bulk can be a real money saver. Why spend extra on small bags of coconut or almond flours when you can save some cash by buying in bulk? The same applies to spices – buying your spices from bulk bins will cost less than the pre-packaged ones. Tip! You can also get cheaper flours and coconut oil online. Don’t forget, in-season fruits are definitely cheaper so why not save your hard-earned money and buy those in bulk and freezing them? Produce, nuts and seeds. Pre-cut and pre-washed fruits and packaged veggies come at an additional cost, as so do chopped, sliced and blanched nuts and seeds. Think budget versus convenience. Convenience always comes at a price. Also keep in mind that chopped nuts and seeds won’t last long and may contain less healthy fats, as they are oxidized when exposed to light. Plus, when veggies are pre-cut, they lose their freshness and a great amount of nutrients. Poultry. Whole chicken may involve more prepping time but on the upside it costs a lot less than pre-cut pieces of packaged chicken. Tip! What to do with the leftovers from whole chicken (e.g. bones, neck, gizzards and skin)? Make your own delicious and super nutritious home-made stock. Sauté the leftover pieces with some onions and garlic in a little bit of coconut oil then add boiling water and toss in some celery and other veggies. Reduce the heat and bring to a gentle simmer until the volume has been reduced by half. And, once cool, you can even freeze the stock in mason jars. Tip! Buy some duck, beef or lamb fat from a local farmer or butcher who sells grass-fed products. Remove any leftover meat or connective tissues and shred the fat using a food processor. Add the shredded fat to a thick-bottomed pot or crock-pot, cover and allow to melt on the lowest heat possible for a few hours. Using a wooden spoon, stir the pot’s content every 20 minutes to ensure that nothing gets stuck to the bottom. Once all the fat has melted, strain the mixture over a glass bowl or jar – do not use a plastic container or the fat will melt through and you’ll end up with a fat-plastic mixture. Let the liquid harden at room temperature. ‘Paleo friendly’ products such as nut milks, kale chips or pre-made meals should not be on your shopping list if your budget is tight – these can be easily made from scratch. For instance, to make almond milk, you only need to soak 1 cup of almonds in about 4 cups of water for 12 to 24 hours. Then blend until you get a homogeneous mixture. Strain out the almond pulp and reserve the ‘milk’ in jars or glass bottles. For a different twist, use half cup of almonds and half cup of hazelnuts or pistachios. Tip! Don’t throw away the pulp – dry it in an oven (set at the lowest temperature) or food desiccators (set at about 110 degrees) for about 4 to 8 hours depending on the amount of almond pulp you’re drying. Halfway through, stir the mixture to improve air circulation. Once it’s completely dried, grind the chunks in a food processer or grinder until you get a fine texture; freeze. Wondering how planning for the week may help stretch your food budget? Well, if you know what you’ll be cooking during the coming week or month, your shopping list will be more accurate and you’ll be less likely to spend money on stuffs you won’t use. You’ll also waste less food due to spoilage. Plus, having everything you need on hand will reduce your need to eat out. Almost 40% of all edible food is wasted in the US, and much of that is on our end – throwing away food we’ve bought but not eaten. On the Paleo diet you can’t afford to be wasteful. If produce has reached it’s peak ripeness, but you’re not ready to eat it, freeze it – before it starts to turn bad. Also, if you buy in bulk because produce is in season or on offer, prepare it for freezing so you can enjoy it throughout the year. Bananas. Remove them from your shopping bag as soon ‎as possible to slow down the ripening process. Peel them and freeze. Berries. Rinse under cold water and pat dry with a dish towel. Freeze the fruits on a tray or large flat plate lined with a baking sheet (so the fruits don’t stick to the tray or plate), leaving some space between the fruits so that they don’t clump together. Once they’re frozen, you can transfer them to a Ziploc bag – make sure to remove as much air as possible from the bag before zipping it. For long-term freezing, you could invest in a vacuum sealer. Broccoli and Cauliflower. Rinse, cut into florets and freeze. Eating paleo can be expensive, but it needn’t be. If you plan ahead, and know when and where to shop, you can vastly reduce the cost of following the Paleo diet, without losing any of its benefits.